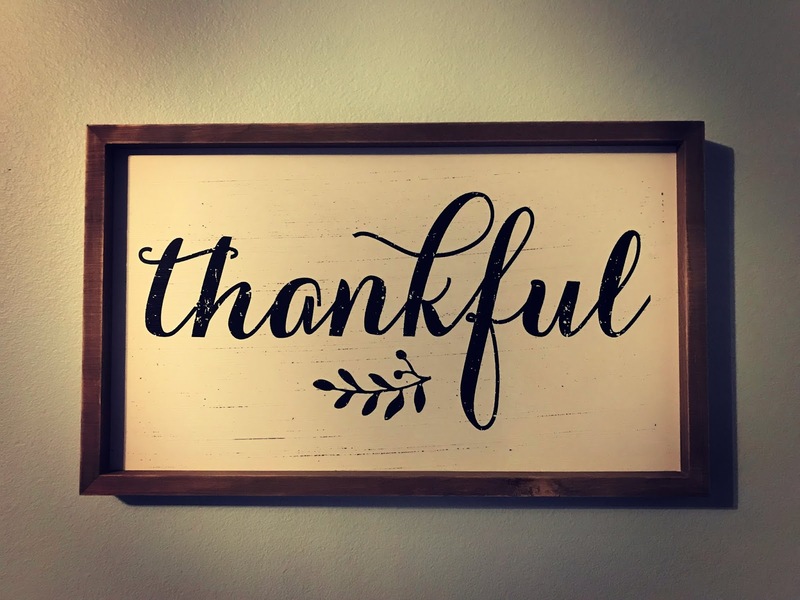 Photo: A framed sign that reads, "thankful"
Thanksgiving 2018 has come and gone, but the reasons to be thankful remain. I hope each of you has had a nice week, and the chance to reflect upon the things that bring you a feeling of gratitude. 1. I'm thankful for John's sister, who again hosted Thanksgiving at her house. I spent Thanksgiving morning making a couple of side dishes, watching the Macy's Day Parade, then catching some of the Westminster Dog Show. In the afternoon, John and I, along with our youngest daughter and two of my sister's boys, went to John's sister's house and had a wonderful time visiting with family (thankful #2) and enjoying delicious food (thankful #3). 4. I'm thankful for willing blogger friends who have each agreed to write a guest post for me in December. Many of my posts in December will be regarding the #LightTheWorld initiative, and the guest posts will go along with the weekly themes. I hope you will check in frequently, learn about various service organizations and how each of these friends incorporate service into their lives, and be inspired to #LightTheWorld, too. 5. I'm thankful for the chance to try new things. Next Wednesday, I will be going live on Facebook for the first time as I attend the unveiling of some service vending machines. These are the same machines that were in Salt Lake City last December. There are other vending machines in New York, Arizona, England, and the Philippines this year, as well. If you follow my Facebook page, you can tune in at 7 p.m. Mountain time on Wednesday the 28th to watch the giving machines in action. 6. I'm thankful I still get excited about snow. We've had some fall from the sky recently, but don't have any accumulating on the ground yet at our house. The mountain peaks are getting whiter, though, and they are beautiful! 7. I'm thankful for a warm house. Even though I love to see the snow fall, I also appreciate the safety and warmth of my house. 8. I'm thankful that Thanksgiving was early this year, so we have the maximum time between Thanksgiving and Christmas. I love the weeks between the holidays to take in the music, lights, and activities of the season. 9. I'm thankful to be in our home for Christmas. Last year, we were living in a temporary rental, and I only minimally decorated. This year, John has already put the outdoor lights up, and I'm almost done with the indoor decor. I love seeing each item finding a place in this new-to-us home. How was your Thanksgiving? What are you thankful for this week? Oh, the snow. It can be so very beautiful but how I dread it! I imagine it will be quite beautiful where you live when it does snow with the mountains so near. Enjoy this Christmas season in your new home. There is snow on the big mountain tops, and it is stunning! We are supposed to have another storm come through this weekend, so I imagine the mountains (at least) will get some more snow. I'm so glad you had a good time celebrating Thanksgiving with family. It's also good that we have the maximum time between Thanksgiving and Christmas. I should've mentioned the warm house as a thing to be thankful for too. hey! my phone-generated comment did not stick! can appreciate, in principle, Item 6... "I am grateful that you are grateful... "
I don't understand why sometimes comments go through, and sometimes they don't. Glad you were able to get this one to stick. The vending machines are really cool; I'm looking forward to the unveiling tomorrow night. Glad you were able to have such a great Thanksgiving with the other side of the family.